Select Applications -> System Tools -> Disk Utility from the menu bar. 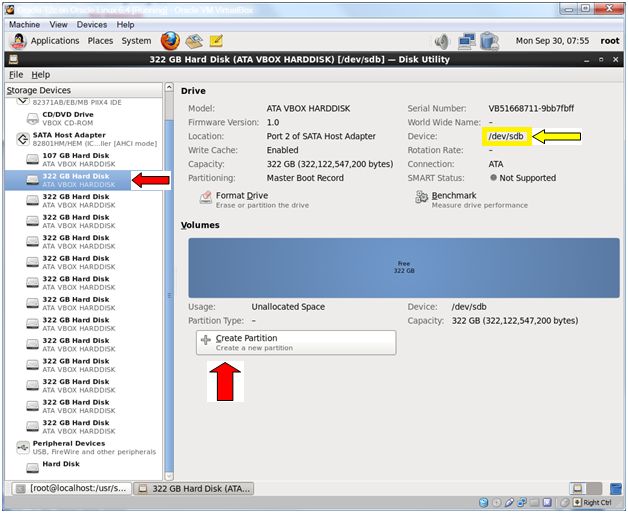 Select the 2nd drive (/dev/sdb) and click Create Partition. You’re looking for the 2nd drive under the SATA Host Adaptor. When you select it you’ll see /dev/sdb in the Device: field (highlighted yellow and pointed to by the yellow arrow). 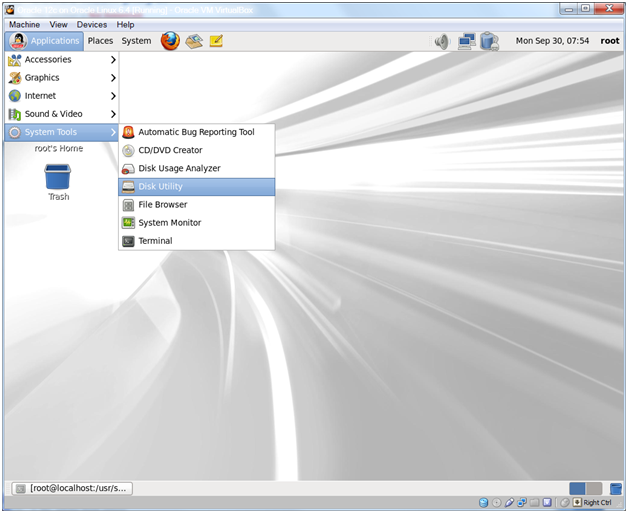 It appears that the latest version of Oracle Linux 6 (6.5) has changed the above UI a bit. You’ll have to use the Format Drive button and choose Master Boot Record in order for the Create Partition button to appear. 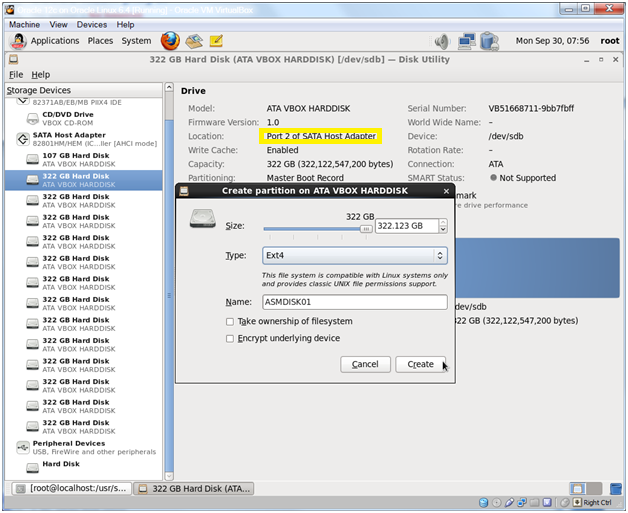 Type ASMDISK01 and uncheck the Take ownership of filesystem box and click Create. Do this for ALL of the ASM disks, incrementing the name from ASMDISK01 through ASMDISK13. If you forget which disk you are creating (disk partition creation takes a while) just look at the Location field. Decrement the port number by one to get the correct ASMDISK number. 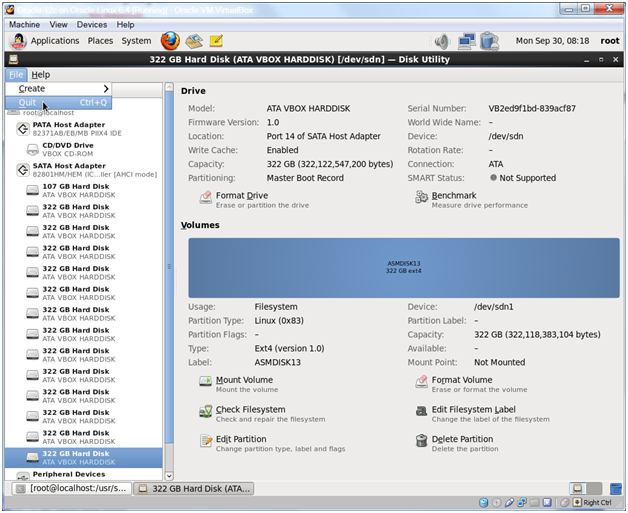 For example; If it reads Port 10 of SATA Host Adapter, then you are on ASMDISK09. I highlighted the Location field in the above screen shot. Once you are finished with all 13 ASM disks, Select File -> Quit to exit the Disk Utility. This entry was posted on Monday, March 31st, 2014 at 7:29 pm	and tagged with ASM, Database Install, Oracle, Oracle Linux and posted in Code, Linux. You can follow any responses to this entry through the RSS 2.0 feed.